NES REMIX (Excitebike) is an Event Course in Super Mario Maker, released on December 31, 2015, and based off of the Excitebike series. It unlocks the Excitebike Mystery Mushroom costume upon completion. Throughout the vast majority of the level, Mario must keep dashing to avoid the Spiny Shells. He must bounce on the trampolines and ride the conveyors to proceed, and avoid a Lakitu during the Castle section. In the NES REMIX series, a variety of classic Nintendo Entertainment System games are given a new lease on life. 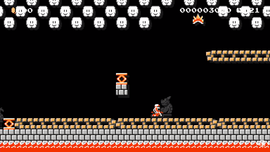 This time, we've picked the Excitebike stages to recreate in Super Mario Maker! Hold the dash button and right on the +Control Pad from the moment the course begins to replicate the authentic motocross experience. This page was last edited on October 7, 2018, at 17:25.